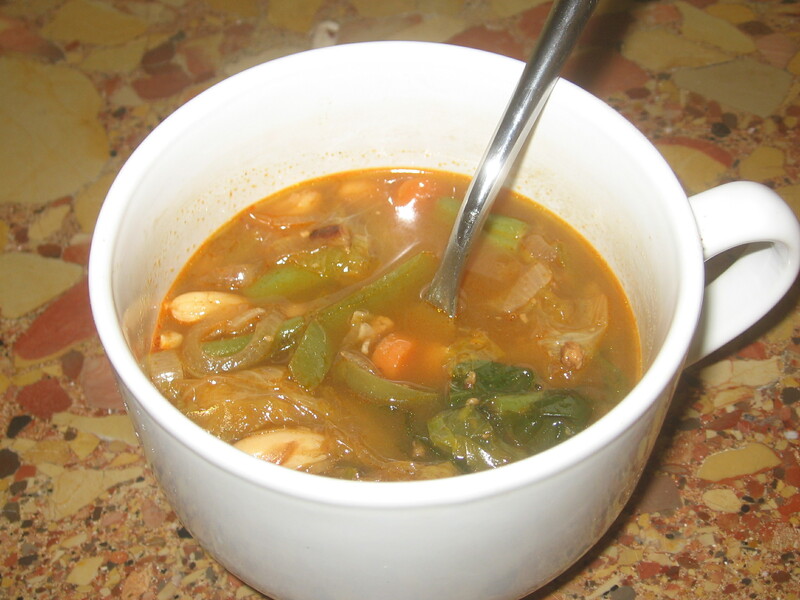 I originally found this recipe while reading Dr Joel Fuhrman’s book Eat to Live. The book was interesting enough but this recipe by far was the best thing I got out of it. I don’t actually remember the original recipe, so this is my own rendition of it. I’m not sure at this point what the specific ingredients were but I like my version quite well. This would make an excellent main course for a Thanksgiving dinner. I like that it’s served in perfect single sized servings! 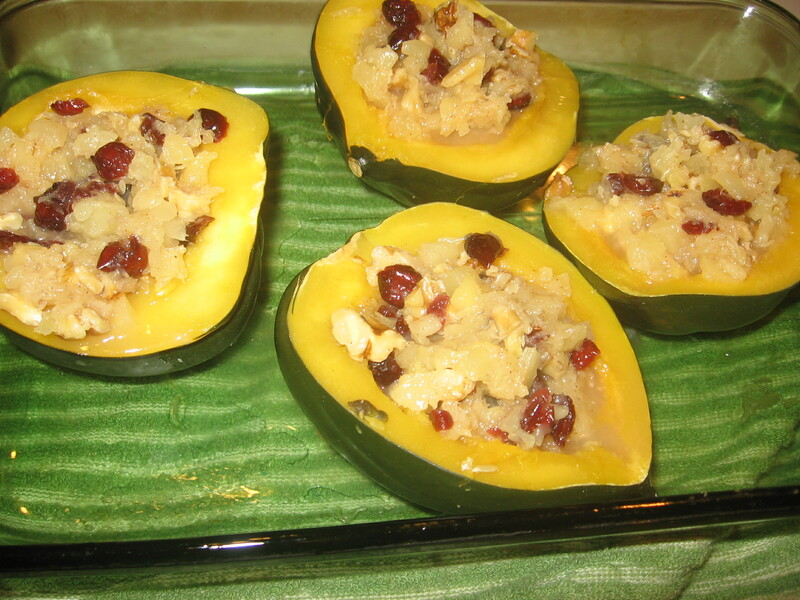 The acorn squash with nuts, pineapple and cranberry will make any plate look festive. I also enjoy taking leftovers to work. It makes a great lunch and people always comment on it. I’m not even sure if this qualifies as a recipe. It’s really just a few ingredients that work well together and there are so many possible add in’s depending on your personal taste. I adapted this from my mom’s cranberry dressing which is made with gelatin, therefore not vegetarian. I don’t really understand her method. She drains out all of the canned berries liquid that had gelled on it’s own and then adds the gelatin to it. It’s very good but not at all worth the bother. Her version takes hours of setting etc. My version is just as good, personally I’d say better and takes about 5 minutes. I’m looking forward to this Thanksgiving. My nephew and his girlfriend will be flying in to join us and I always love company. The only part I don’t like is where I’m the one who cooks the turkey. My mom and I actually have it worked out where she purchases it, cleans it up, and removes the utterly disgusting baggie of insides etc. Thanksgiving morning she’ll drive it over to me and I’ll pop it into my oven. She cooks up whatever’s in those baggies to prepare the gravy and then finishes the gravy at my house once the bird is done. It’s not ideal for me personally but it’s a good compromise. Thanksgiving is the one meal where I actually don’t want a main course. Even as a kid I barely touched the turkey. My family goes way overboard with all the yummy side dishes and I’d much rather enjoy a variety of veggie dishes than any one main dish. 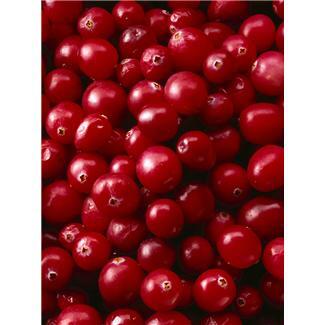 This cranberry dish is a favorite of mine. I can imagine many possible ways to change it with a few different ingredients but my family likes holiday foods the way they’re used to them so I’ll stick to the basics once again! It’s been awhile since I’ve posted anything simply because I haven’t been cooking anything but some of my old stand by recipes. 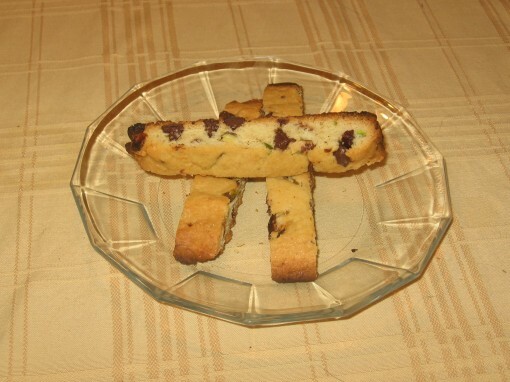 This is a recipe I’ve stolen borrowed from my daughters abandoned blog. I’ve been waiting all year for fresh cranberries to be back in season so I can try it. With the exception of the fresh cranberries all the ingredients are in either my pantry or fridge which I love.I’ve put this dressing on top of a salad made of fresh greens, sliced apple, onion, walnut, cucumber and feta. I think it would also be a great dressing to accompany a variety of veggie sandwiches. Sorry there are no pictures once again, but it’s a salad dressing. You can pretty much imagine what it looks like! I am still very much adjusting to the hectic pace of my days and stopping to grab a camera does not seem to be in the forefront of my mind these days. The good news is that while I’m nervous about the ever increasing pace of my job I am absolutely loving it. I get to help people work through a troublesome experience (minor car accidents) and work to resolve their issues with as little inconvenience to them as possible. It’s very rewarding and the busy days fly by. Put a couple of tablespoons olive oil in a small sauce pan and put on high heat. Add cranberries and put the lid on. The cranberries will sorta ‘pop’ like popcorn, so you don’t want that oil splashing onto you. When the popping stops lower heat and mash with a potato masher. At medium heat add wine, vinegar, and mustard. Stir in more olive oil if desired. Blend together. Add water if desired. I love when I find a recipe that my husband enjoys without commenting on the lack of meat protein. I was surprised to find out that this was one of them. As far as I know he’s not a big fan of squash but he happily ate this meal including a second helping as well as leftovers later in the week. That makes it a hit in my book! Another great thing is that this is a vegan and gluten-free dish. I wish I had taken a picture of this because it’s actually a very pretty chili. It’s quite colorful with the dark red sauce, bright orange squash, and the assortment of beans and peppers. However, having assembled it one day and completing it the next I totally forgot. It’s been a crazy week for me. I’m sure I’ve mentioned that I’m starting a new job. I’m in the process of becoming an insurance claims adjuster. A few weeks ago I had to go through a course to get my state license. That was tough enough. Now I’m in training to learn how to actually do my job. For the first time in my life I feel at a disadvantage and I’m trying to figure out if it’s age related. It definitely feels like those in their 20s and 30s are catching on quicker than us older 40 somethings. I am enjoying the process I just wish it would come to me a little quicker. With that said, I don’t remember the last time I was so grateful for the weekend! I’m considering a trip to the beach while my husband is thinking about chores around the house! Perhaps we’ll barter for a day of each. In the meantime I’ll be looking for something new to make using some of the 2 bags of barely I have. Another sign of aging, I bought 1 bag this week and realized that I already purchased barley last week. If you have a great barley recipe for me, please share! My sister Sandy makes this soup all the time so I decided to give it a try. The recipe she gave me was really just a list of ingredients so I really created it with just a basic idea. I am really impressed with the results. 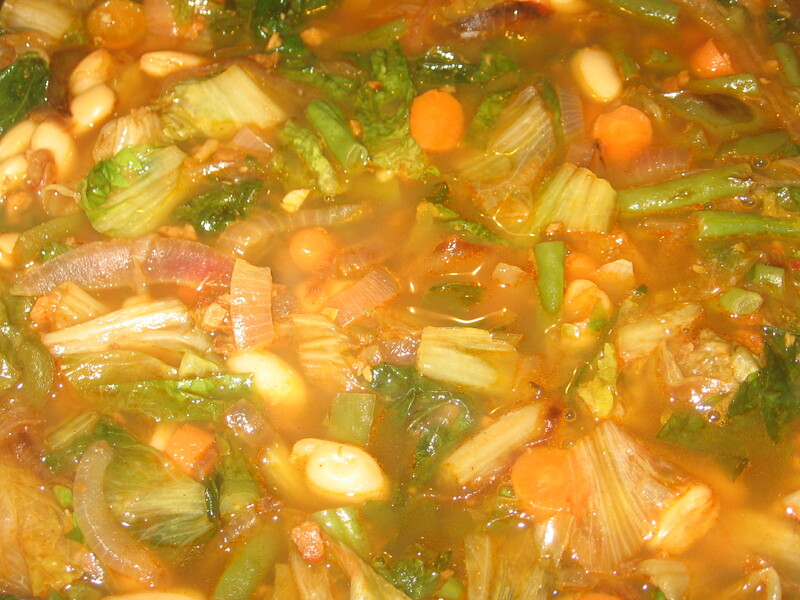 It’s a thick, hearty soup full of delicious vegetables and it’s super nutritious! I actually made it a couple of days ago and brought a serving to work yesterday and will do so today as well. I really need to get a good thermos for soups and such. The soup is currently being transported in a glass bowl with a snap on lid. I’m placing 50/50 odds on if the cover will stay on until lunch time! The price of a simple thermos was pretty shocking to me. This is old technology, why is a basic single serving thermos around $20? I really didn’t want to spend that much. Before I get to the soup we had a family dinner at my parents last night. My mom made some family favorites which I will post about another time. She made tzimmes and noodle pudding which I love. My contribution was Mmmm, Mondel Brodt which was served for dessert and was a hit as always. It’s Labor Day in the US which means I’m having the family over. I’m sticking to a basic barbecue with some simple sides. Since coming home from Europe my son has been eating a lot of cucumber and tomato. I’m pretty sure it’s the Mediterranean influence. So today I’m going to make him a Greek version of a cucumber salad. I’m pretty excited because I’ll have almost a full house. My daughter and her boyfriend will join us, my son of course, and my niece who will be moving in with us today. To round out the generations my parents will be joining us. I enjoy preparing meals for my loved ones. My one upset is that I thought Ghirardelli’s brownie mix was vegan and was going to follow the directions on the box except using banana in place of the egg. I didn’t read the box until I got home and discovered that the variety I bought is not vegan. Now, it doesn’t really matter since my dinner itself won’t be vegan but I think it’s cool to slip a vegan dessert by everybody without their realizing. I decided to try the banana anyway considering the entire egg recall fiasco. They look yummy! Back to my salad, I prepared it hours in advance to let the flavors soak together. Personally I’m not a fan of olives so I omitted them. That’s probably pretty selfish of me since others like olives but at this point I don’t have them in the house and I’m making it the cook’s prerogative. Also, I went pretty traditional and stuck with red wine vinegar but I see no reason not go get creative and try a different variety. I’m turning over a new leaf. This one will be a green vegetable leaf. I’m going to get myself back to super healthy eating and start working on weight loss. My goal is to follow the basic premise of Michael Pollan’s Food Rules and just eat as healthily and naturally as possible. Other than that I have no intention of following any diet gimmick. I’m going to start this by attempting a variety of different salad dressings. I’ve not liked store-bought dressings for a long time but have pretty much stuck to oil and vinegar. 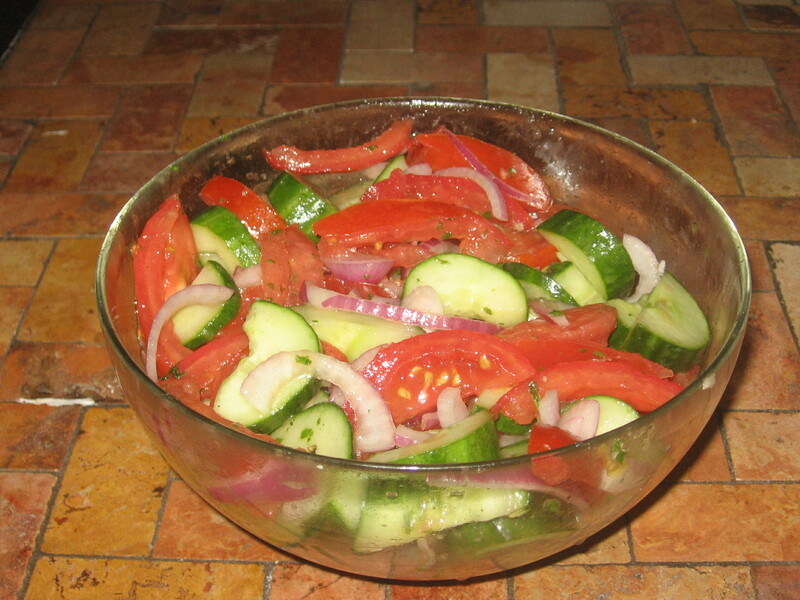 I love a simply dressed salad and have a large variety of different vinegar but after a while that gets old. Then I stop eating so much salad and next whatever weight I’ve lost starts to creep back on. I’m starting today with this Tangy Vegan Dressing which is similar to a French dressing but not quite the same. 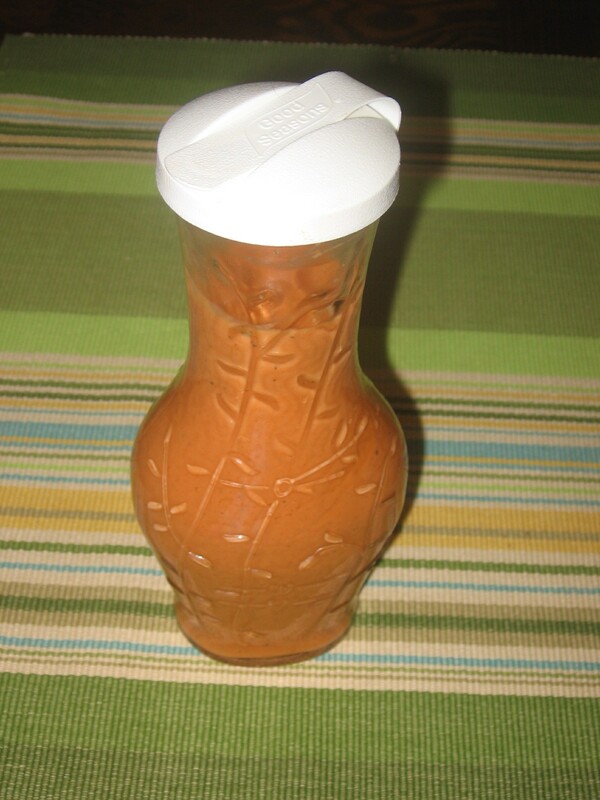 This one the main ingredients are organic ketchup and organic dijon mustard which provide the tangy taste. This dressing will definitely work well with a basic salad topped with some sliced veg chick patties or crumbled burger. 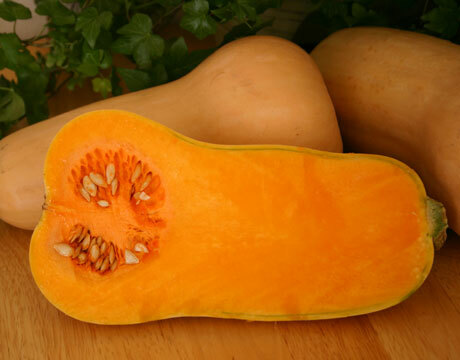 It will also go well with just a simple salad. This recipe is so simple it took about 5 minutes total and is both vegan and gluten-free. 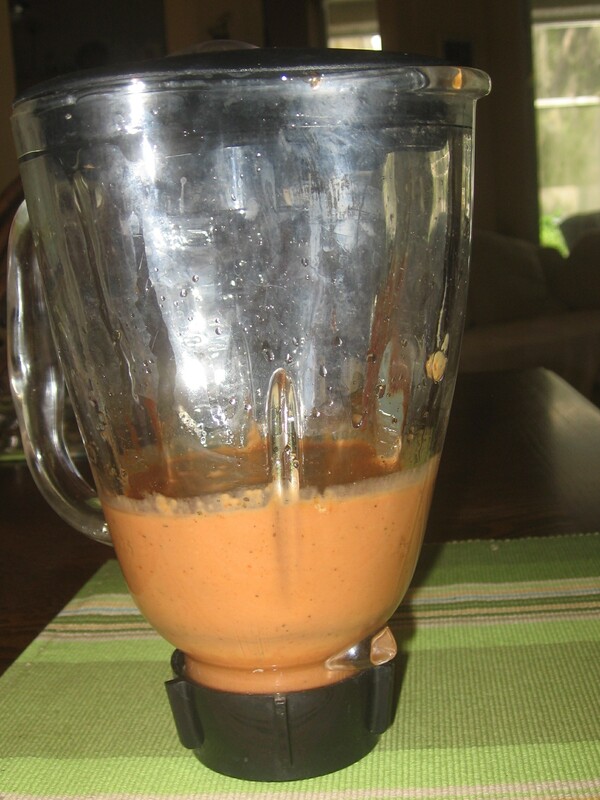 Toss all ingredients into a blender or food processor and blend until well mixed, chill and serve!